What we know about college and income: Obtaining a four-year degree is worth about $1 million over a lifetime compared to not earning a college degree.Obtaining a degree from one of the 20 most elite universities is several times more valuable than earning a degree from a non-elite undergraduate university. 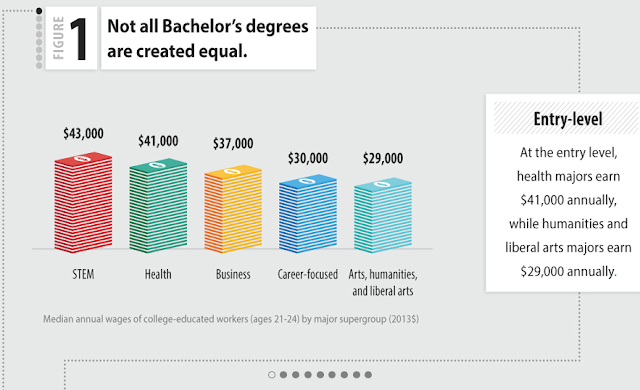 Obtaining a science, technology, engineering, or math degree from any respected school is better than a liberal arts degree, by an average of $3.4 million in lifetime earnings!Obtaining a liberal arts degree from a low-ranked school is similar to not having attended a college! The following charts are from the CEW 2015 report, based on 2014 data.